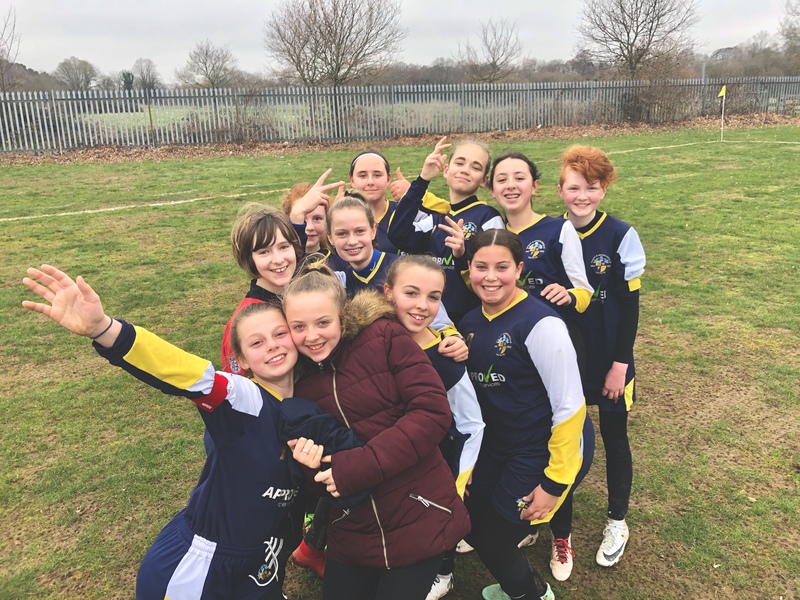 In its inaugural season, the Hampshire Girls Youth Football League initially organised its leagues regionally while also taking into account the strength and experience of each team. The plan was for each team to play each other once and then after Christmas the leagues would be re-organised based on results. We were placed in a league with Ringwood Town, Worthys Youth, Southampton Saints, Verwood, Pace Wildcats and Chamberlayne Athletic. Our first game of the new season was against Worthys Youth in December. While all other matches across the league were called off due to the heavy rain this match was able to go ahead as our home ground, Front Lawn, has a 3G pitch. With the benefit of hindsight, both sides will have been better off had we postponed it. The conditions were terrible! The wind and rain meant that both sets of girls were soaked before the game had even begun. Neither side were able to play particularly good football and I don’t think any of the players really enjoyed the experience. Although once they’d dried off Worthys will have enjoyed it slightly more as they won the game 4-2. Our goals coming from Ellie B. 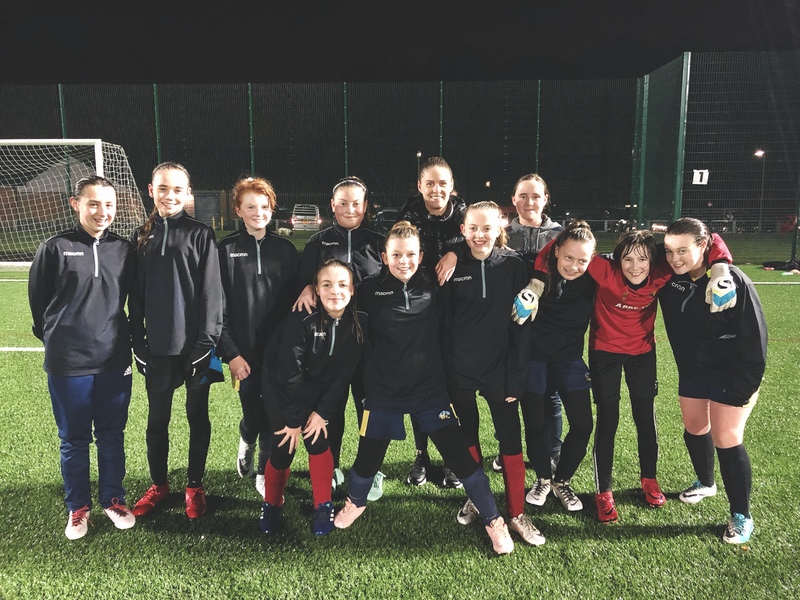 Before our season restarted after the Christmas break, the girls were invited to be the mascots for Chichester City Ladies in their top of the table clash with Coventry United. I’ve never seen our normally boisterous girls be as shy as they were that day! They really enjoyed the game and meeting the players. The club were so welcoming, especially club captain Lauren Cheshire who was absolutely brilliant with the girls. You can read my match report here. Havant & Waterlooville Girls waiting to lead out Chichester City prepare to take on Coventry United. 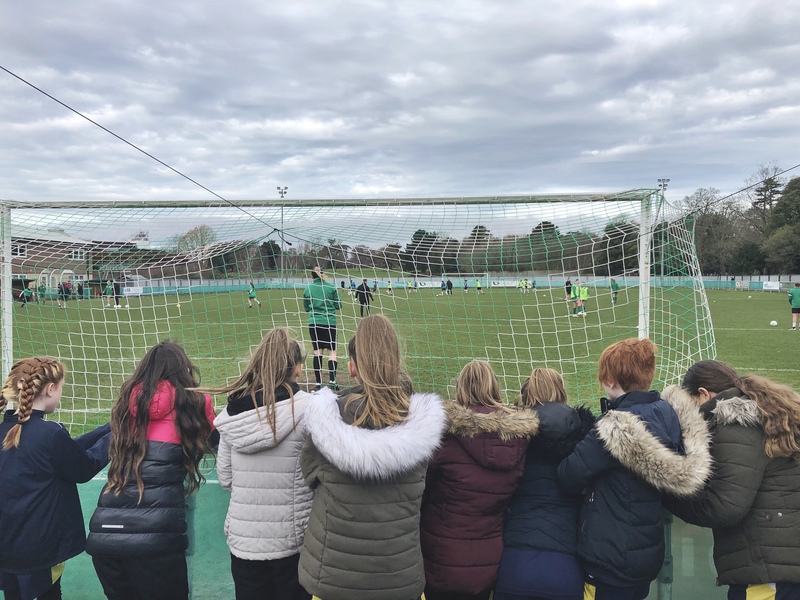 Havant & Waterlooville Girls watch as Chichester City prepare to take on Coventry United. It was yet another damp day as we travelled to the Hampshire and Dorset border to take on Ringwood Town. The parents that came down to watch despite the weather were treated to a fantastic match. Not for the first time, we started slowly and conceded early. Credit to Ringwood, they came at us from the first whistle, not allowing us any time to settle on the ball and we struggled to cope initially. After going 4-1 down we managed to settle down and get ourselves back into the game. We made it 4-3 with goals from Teigan and Nia. At this point, we were playing with confidence and looked like had you given us another five minutes then I think that we would have come back to get at least a draw. It was great to see us starting to score goals and looking dangerous going forward. Our match against Chamberlayne Athletic the following week was a huge missed opportunity for us. We didn’t need to play well to win this one, we just had to work harder than our opposition as were missing some of their regular starters due to a sickness bug. We weren’t clinical enough to take advantage and Chamberlayne won the game 2-1. We only had ourselves to blame for not picking up our first victory of the season. While the defeats were disappointing there was so much to be proud of. Prior to Christmas, the girls were learning about their positions, getting to know each other and we rarely troubled the opposition goalkeeper. Post-Christmas it was a different story! We had begun to look dangerous and the fact that I am saying we’ve missed realistic opportunities to win is a sign of progression and improvement. It’s been great to see Teigan maturing as into one of our most important players and scoring goals. I see no reason why she cannot strive to reach double figures in our remaining seven games. We were extremely fortunate to welcome another special guest at training, Reading Women‘s captain, Kirsty Pearce. We are all so grateful that Kirsty took the time to work with the girls. She even went in goal for the match at the end. 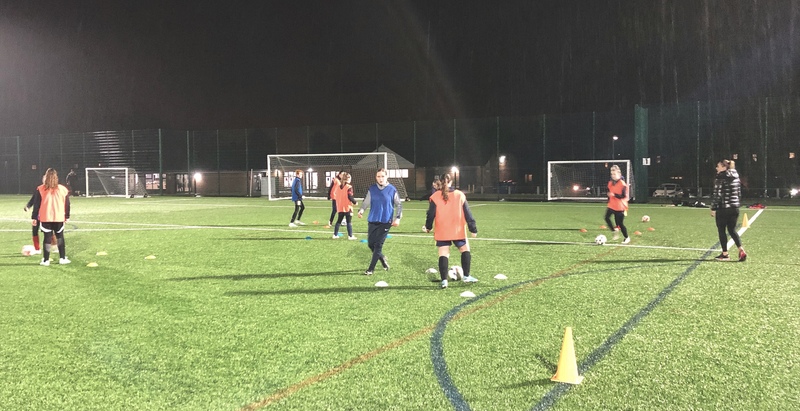 Our girls had such a great time despite the drizzle that was coming down the whole session. Our next game was yet another away game against Pace Youth and as you will have guessed from the title of this chapter, we picked up our first victory of the season! This game saw Ella making her debut after joining from Portsmouth in the Community and it didn’t take her long to make an impact by opening the scoring after seven minutes. We went into half time with a 3-0 lead, Ella finding picking up her second, while club captain Ellie added another. Pace looked dangerous going forward, they attacked in numbers and had they been more clinical in front of goal then the scoreline could have been closer. Ella completed a perfect debut with another brace in the second half in a comprehensive 5-0 win. This was a great achievement for the girls and it was much deserved! Had it not been for some superb goalkeeping from Pace’s keeper then it certainly could have been more. It was great to see the girls so happy and our challenge is to build on this result and maintain this level of performance for the rest of the season. We started poorly in our next match against Verwood, going 3-0 down in the first ten minutes. All three goals were easily preventable and the girls knew it. Full credit to them, they managed to get back into the game through goals from Ella and Nia. The match ended 8-6 to Verwood but it could and should have been very different. We missed plenty of chances of our own but ultimately failed to recover from giving Verwood a headstart in the game. Seven of Verwood’s goals coming from Emilie who became the league’s top scorer after this result. While the defeat was disappointing, Thom and I were really happy to see us looking so dangerous going forward and are really proud that the girls never gave up. It not all about our output in front of goal, we are seeing the girls playing with belief and passing the ball around, just like we worked on in training. The girls bounced back in their next game against Worthy’s Youth, winning 3-1 thanks to a brace from Ella and one from Ellie H. While the scoreline was relatively tight I felt that the result was fair. Worthy’s goal came from a goalmouth scramble after a corner kick. Other than that, our defence and midfield limited Worthys to speculative shots from distance which failed to trouble Katie W.
The girls appeared to have learnt from their mistakes at Verwood and were really solid at the back. It was so pleasing to see them supporting each other, doubling up on the attacker and giving them little opportunity to get through. After a month training with us, Vakare made her debut in midfield. She supported the forwards in our attacks as well as coming back to help the defence when needed. She was everywhere! The dictionary definition of a box to box player and a welcomed addition to the team. Unfortunately, Southampton Saints and Girls have pulled out of the league so we left with five league games before the end of the season. We are all pushing for a strong end to the season and we’ll be hoping to end the season on a high and strengthen our case for promotion next season. You can stay up to date with the side via Twitter at @HavantGirlsFC.